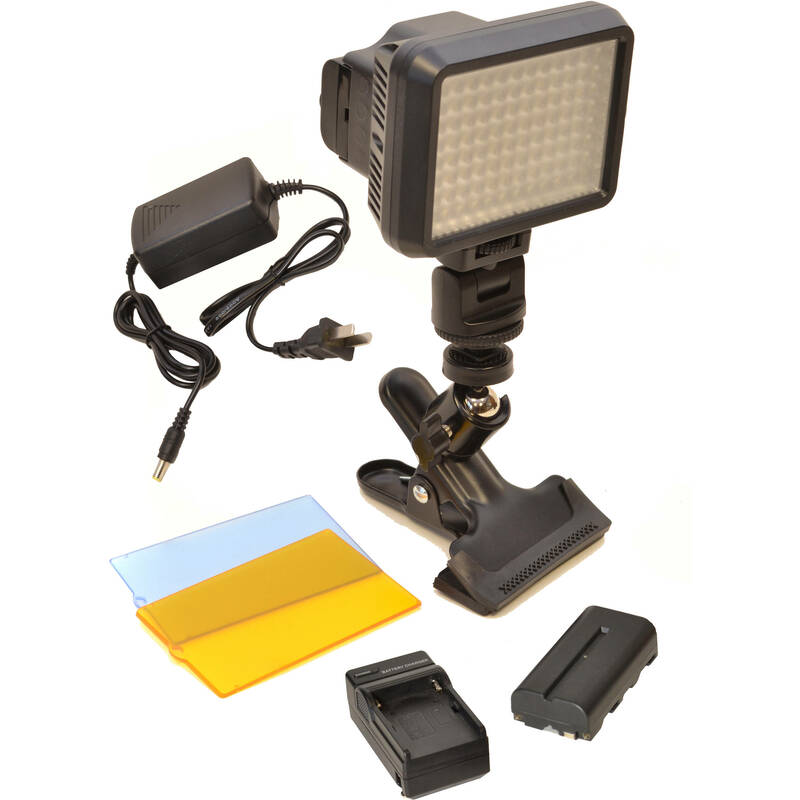 If you need a bright, compact on-camera light for your production, this XT96 On-Camera Light Kit from Bescor provides a 96 LED XT96 on-camera light, a 7.4V 2200mAh NP-F-type battery, a battery charger with an integrated plug, an AC power adapter, and a clip clamp with ball mount. The XT96 features 5600K daylight-balanced light, 10-100% dimming, a shoe mount, and three filters. The adapter provides 12 VAC, 2A power when mains power is available, and the NP-F battery can be utilized when in the field. Use the clip clamp to mount the light on a table, stand, or other surface. The Bescor XT96 5600K On-Camera Light is an on-camera, dimmable, daylight-balanced 5600K LED light designed to combine bright output with a compact form factor. The compact and lightweight light features 10-100% dimming. Powered by either one NP-F battery or an optional AC power adapter, the unit's 96 LED bulbs produce a bright beam with a rating of 687 lux at 3.2 feet. Suitable for both video and DSLR cameras, the XT96 includes a clear filter for softening glare, a blue filter to further cool the light to 7500K, and an amber correction filter to warm the light to 3200K for shooting indoors. This light utilizes one NP-F battery and can also run off AC power with an optional 12 VDC/2A adapter. The XT96 offers 96 individual LEDs for a wide beam. Dimmable from 100 to 10%. The included blue 7500K filter helps cool the image for outdoor shooting, the 3200K amber filter provides a softer, more natural lighting effect, and the clear filter helps smooth and even out the light's tone while reducing glare. Filters are easily removed from the unit's housing by sliding them in and out of the built-in filter holder. This Bescor NPF-Style Non-Decoded 7.4V 2200mAh Battery & Universal 18W Automatic Battery Charger Kit consists of a battery and a charger. The battery is well-suited for battery-powered light fixtures and monitors that support being powered by NPF form factor batteries. However, it is non-decoded, which means it will not power a camera that requires communication with a Sony-branded battery. If you need to mount a lightweight on-camera light in an alternate location, use this Clip Clamp with Attached Swivel Ball Mount from Bescor to attach it to a C-stand, light stand, or surface such as the edge of a table. A swivel ball mount attached to the clip features a 1/4"-20 screw to mount your light. The clip jaws have a soft grip texture to protect and secure onto the mounting surface. Use this AC12V2 AC Power Adapter with Power Cord as a spare or replacement to power select Bescor lights. The adapter features a 12 VAC, 2A 2.1mm barrel output and the power cord is attached to the power module. Box Dimensions (LxWxH) 5.4 x 4.1 x 4.0"
Box Dimensions (LxWxH) 5.3 x 4.8 x 2.95"
Box Dimensions (LxWxH) 8.0 x 4.5 x 4.25"
Box Dimensions (LxWxH) 4.5 x 2.9 x 2.1"